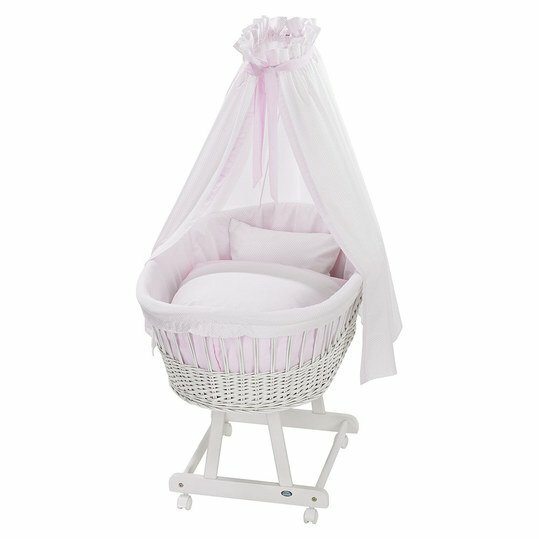 With the complete bassinet Birthe in white including bassinet set Little Dots Rose from Alvi you have everything your baby needs for a restful sleep. 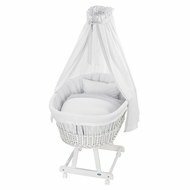 The complete set includes a bassinet, a fleece mattress, a canopy pole with canopy and a bed linen set with nest. The hand-woven wicker basket is extra large and has a particularly large lying surface. The solid pine base stands on four rubberized and brakeable castors that facilitate rolling on smooth surfaces. So you can move your baby comfortably from room to room in his sleeping room. The supplied mattress has a breathable fleece core which ensures that oxygen can penetrate through the mattress and CO2 is removed. 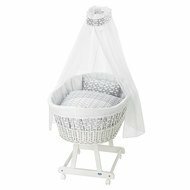 You can attach the white sky bar directly to the basket and attach the pretty sky of the bassinet set to it. In the twinkling of an eye you have created a cosy sleeping atmosphere for your baby. The cuddly nest cushions the pasture basket to protect your baby from injury. 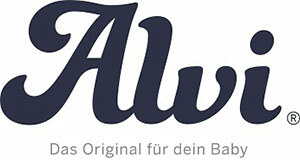 The bed linen consists of a pillowcase and a blanket cover with süuml;um;em Pünktchen print. 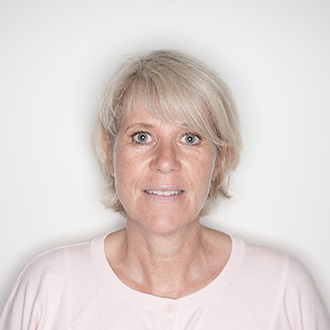 The skin-friendly and breathable material is ideal for cuddling and dreaming. Alvi's classic white lacquered basket and cute Little Dots Rose design give any room a warm atmosphere. Your baby will feel comfortable and secure all around.